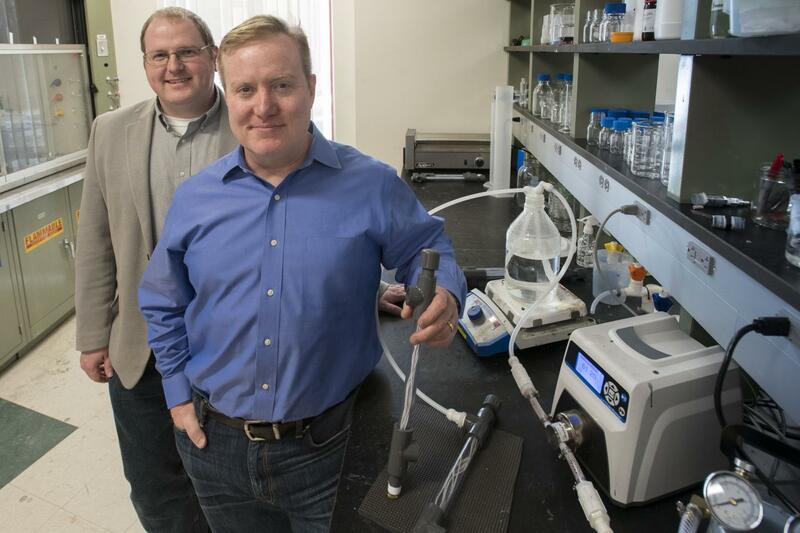 When Rob McGinnis needed a well equipped lab for his startup company, his graduate school friend, Jeff McCutcheon, associate professor of chemical and biomedical engineering, suggested he apply for UConn's Technology Incubation Program (TIP) at the Storrs campus. The lab gave McGinnis the research facilities and access to other University resources that he needed to launch his business. He developed carbon nanotube technology that will have multiple, far-reaching business applications. "UConn is far ahead of other institutions," says McGinnis, who met McCutcheon when they were both at Yale University working on their doctorates. "It's not just the physical space that provides value. I am pleased to be treated as a member of the University community." McGinnis joined TIP when he formed Mattershift, a company that designs and manufactures nanotube membranes for carbon-zero fuels, optimized air and water, and precision medicine. The company seeks to convert carbon dioxide from the air into fuels, fertilizers, pharmaceuticals, and construction materials without using fossil fuels as inputs. McGinnis sought to find a way to make carbon nanotube membranes – which he calls a "wonder material" – in a way so they could be mass produced. The technology had been around for about a decade when he started his company. "This technology gives us a level of control over the material world that we've never had before," McGinnis says. "We can choose which molecules can pass through our membranes and what happens to them when they do." Currently, the company is working to remove carbon dioxide from the air and turn it into fuels, a task that has been done using conventional technology, but is too expensive to be practical. "Using our tech, I think we'll be able to produce carbon-zero gasoline, diesel, and jet fuels that are cheaper than fossil fuels," says McGinnis. McGinnis didn't share intellectual property with McCutcheon or explain how he cracked the code. But McCutcheon tested the technology and confirmed its accuracy. McCutcheon, who owns less than a 1 percent stake in Mattershift, says his credibility as a scientist is paramount because he has a reputation to maintain. "I enjoy serving as a consultant and as a member of their Scientific Advisory Board," says McCutcheon. "But as with any new tech that comes into the membrane field, I am going to be extremely critical. Mattershift needs someone like me to be impartial evaluating their technology. I can be that person since I don't work with competing forms of technology." In today's environment, a good idea is not enough to garner research and development funding from some sources, McCutcheon says. Entrepreneurs need this type of unbiased review to prove that their theory works. They also need partners to publish this work in the scientific literature and seek grants. McGinnis says he benefits from proximity to researchers like McCutcheon and highly trained student talent. McGinnis, who says he "lives in a sea of risk," says he appreciates the resources offered through TIP. Universities typically offer startups some desks with laptops, he says. "Very few places provide material science space for a startup," says McGinnis. Unlike some universities, UConn provided the lab space and assistance with no strings attached. His inventions and intellectual property belong to him exclusively, the entrepreneur says, adding, "There's no attempt to try to own it." McCutcheon and his students benefit as well. "I was glad to be part of it. I was excited to see a startup from the inside, and I learned a lot about not only the business aspects, but how technology is vetted by different members of the finance community," McCutcheon says. "Having Rob around gave me a sounding board for my ideas and I learned how the two groups, academics and entrepreneurs, with divergent incentives, could work together for mutual benefit." There are more tangible benefits as well. The group published a paper March 9 in Science Advances. And, one of McCutcheon's graduate students, Kevin Reimund, from East Haven, Connecticut, worked or McGinnis as an assistant for two years, gaining real-world experience before pursuing his Ph.D. with another one of Mattershift's advisors, Benny Freeman, professor of chemical engineering at the University of Texas, Austin. Mattershift has completed development of its programmable molecular gateway technology, and the company has already booked its first sales to Trevi Systems of Petaluma, California. It will ship products later this year for use in a seawater desalination process. "Academics should seek to work with someone like Rob," says McCutcheon. "He's a pure entrepreneur. He offers me a window into a world I know little about. "